Light, bright, herb-marinated Grilled Shrimp Skewers transform a weeknight dinner into something worth celebrating with almost no effort at all. After the marinade works its magic, just skewer the shrimp and turn on the grill. When you can’t bear to eat another rotisserie chicken (trust me, we’ve all been there!) grilled shrimp can really rescue you from dinnertime boredom. These easy shrimp kebabs turn out great on the grill or under the broiler, so go ahead and put that chicken down. 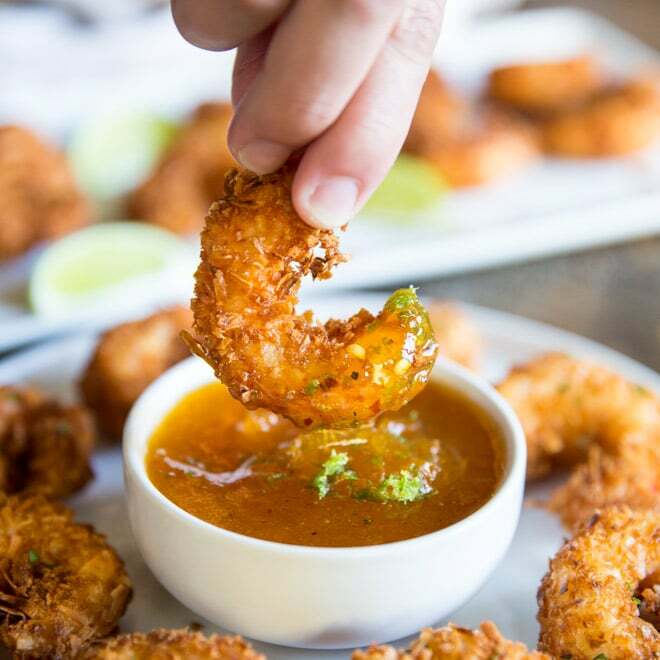 Shrimp are naturally low in fat and high in protein, too. The zippy green marinade has just the right amount of garlic, herb, and lemon juice so you don’t have to worry about over-marinating your shrimp. They’ll be fine in the sauce for up to two days without “cooking.” That makes it easy to prepare ahead of time. Planning a huge shindig and need shrimp skewers for all your friends? Click and slide the number next to “servings” on the recipe card below to adjust the ingredients to match how many you’re feeding—the recipe does the math for you, it’s that easy. What size shrimp do you buy for Grilled Shrimp Skewers? The bigger the better! I look for jumbo size shrimp, which are 16-20 per pound. You can go smaller (or larger) if you need to, though, and the recipe will still be delicious. I always have a big bag of frozen shrimp in my freezer, so I can make grilled shrimp on skewers when requested. Of course, I’d never say no to using fresh shrimp, either—it’s all a matter of how lucky I am, what’s available, and what’s cost effective. First, blend up a quick garlic/herb/mustard marinade. This can be done in a food processor or blender, whatever you want. Pour the marinade over the raw shrimp, scraping down the sides of the bowl to get all the good stuff. I prefer a zip-top bag or a shallow glass casserole for marinating shrimp. Ideally, the flavors in the marinade need about an hour to take care of business, but you can mix everything up the day before, too. Grilling shrimp can be tricky without skewers, as anyone who has lost too many crustaceans to the fire can attest. The skewers are handy for keeping those precious shrimp on the right side of the grate, and they make flipping easier, too. If you’re using wood or bamboo skewers, though, they’ll need to be soaked in water beforehand. Soaking prevents the wood from catching on fire during grilling. If you like to make a lot of kabobs at home, consider investing in a set of stainless steel skewers, which don’t need an advance soak. They wash easily in the dishwasher and can be used over and over. Some cooks like them because they’re splinter-free, too. When the skewers have been soaked in water for about thirty minutes, stick 5 or 6 shrimp evenly onto each skewer while the grill heats up. Then it’s time to throw them on the barby. How long do you cook shrimp skewers on the grill? Preheat your grill to 350-450 degrees and set it up for direct cooking. Grill the shrimp over direct, medium heat for 4-6 minutes, turning the shrimp halfway through the process. The outside of the shrimp turn a bright pink color when cooked, while the meat inside should be white and opaque. 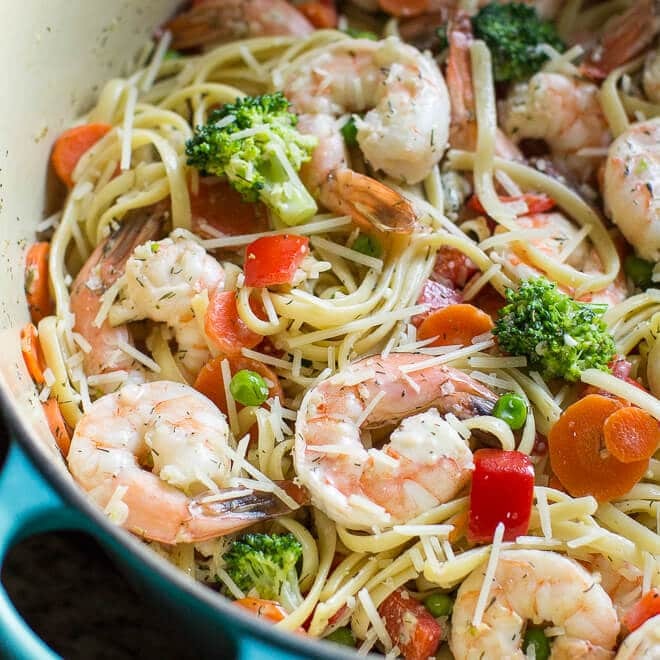 Shrimp cook super fast, so plan accordingly. 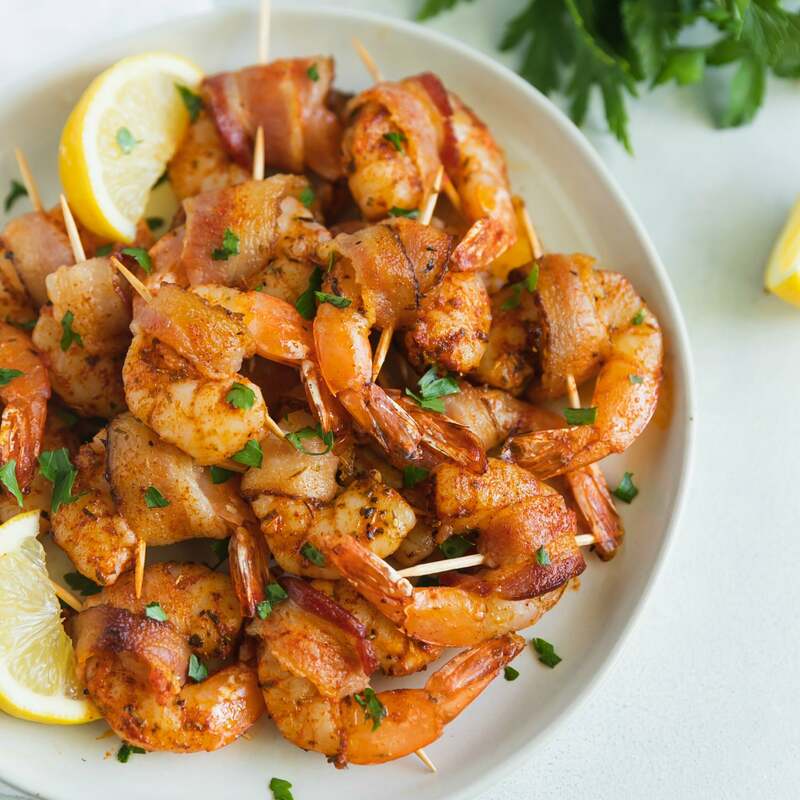 Even if you’re using a gas grill, a charcoal grill, the broiler, or a grill pan on the stove, marinated shrimp kabobs cook within 3-6 minutes, depending on the size of the shrimp. What can you use instead of fresh basil? Out of season, basil is hard to find or crazy expensive for even a small amount. In that case, use some fresh mint, cilantro, or extra parsley. All the fresh green herbs work when it comes to shrimp marinade. Can you make Grilled Shrimp Skewers with vegetables? Fresh shrimp and grilled vegetables make a spectacular dinner! The shrimp cook so quickly, but cherry tomatoes, zucchini cubes, and onion wedges take quite a bit longer than shrimp. No one wants a dried out, rubbery shrimp alongside a raw chunk of onion on the plate. I solve this problem by making all-vegetable kebabs separately and get them started in advance, before the shrimp skewers. That way you’ve got perfectly cooked vegetables, and shrimp that aren’t tough from being overdone. Can you make Grilled Shrimp Skewers with pineapple? Slivers of fresh pineapple skewered with the marinated shrimp might be a delicious thing, indeed! Make some grilled tortillas for tacos, or serve them over rice noodles for a sweet and summery supper. Make my Vietnamese dressing/dipping sauce Nuoc Cham for the noodles–you’ll love it! What to serve with grilled shrimp? Almost everything! Grilled shrimp taste incredible with roasted vegetables, over leftover grain salads, or pasta. I love shrimp on top of a heap of the best mashed potatoes, too—try it if you’re feeling like something hearty. Nothing wrong with a mixed grill, either! Serve grilled shrimp skewers next to a juicy steak, Rosemary Roasted Potatoes, and get ready for the thank-yous. Grilled shrimp are pretty great on their own. 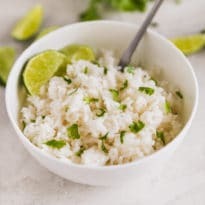 Come to think of it, Cilantro Lime Rice might be a perfect side, or a sheet pan of seasonal roasted vegetables: broccoli, cauliflower, or Roasted Green Beans. 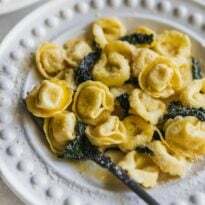 In a food processor or blender, combine onion, olive oil, basil, parsley, garlic, lemon juice, Dijon, dry mustard, 1 teaspoon salt, and 1/2 teaspoon pepper. Process until smooth. Pour into a zipper-top plastic bag. Add shrimp and toss to coat. Cover and marinade for 1 hour at room temperature or up to 2 days in the refrigerator. Soak skewers in water for 30 minutes before grilling. Open bottom vent completely. Light large chimney starter filled with charcoal briquettes (6 quarts). When top coals are partially covered with ash, pour evenly half of the grill. Set cooking grate in place, cover, and open lid vent completely. Heat grill until hot, about 5 minutes. Turn all burners to high, cover, and heat grill until hot, about 10 to 15 minutes. Clean and oil cooking grate. Add 5 or 6 shrimp per skewer. Grill the shrimp for 2 minutes on each side. To broil the shrimp in the oven, place skewers 3 inches from the broiler and cook 2 minutes per side.